Extra Large / Size #4, Drum Diameter: 3-1/2 to 4"
Winchers are a specially designed rubber molding which fits over the top of standard winches converting them to self tailing. 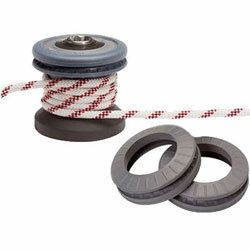 Easy to fit and available in four sizes to suit most winches. The simple operation works when the line is sheeted under load causing the coils to climb up the drum and are then gripped by the underside of the rubber body. When the sail is trimmed, cleating is achieved by locking the line into the ribbed groove.